The reason Dotonbori is called as such. 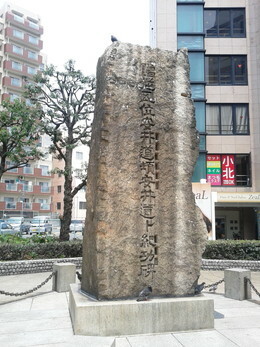 Monument of Mr. Yasui Douton who led construction of Doutonbori-canal. it repaired for its 100th anniversary in 2014. In 1612, Mr. Yasui Douton worked on the project of constructing a canal in Minami, but died in a war called "Osaka Natsuno Jin" or "The Siege of Osaka". After he died, his cousin Mr. Douboku took over the project. In 1615, the canal project was completed and named Dotonbori to praise Mr. Douton's merits after his death. Douton was taken from his name, and "bori" (from "hori") means "moat" or "canal". 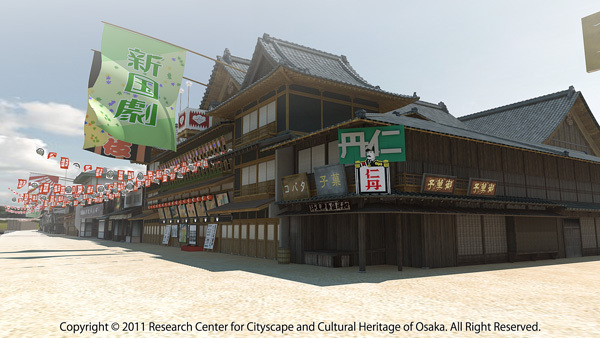 Afterwards, the Edo shogunate government ruled over Osaka and began urban development. In 1619, Mr. Kyubei Yasui became the urban development executive in Minami. He decided to relocate famous show theater to Minami in 1626. 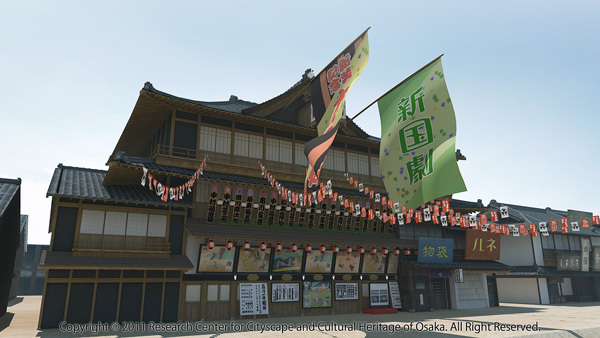 This ended up affecting Minami urban development so much that it turned into a theater town. 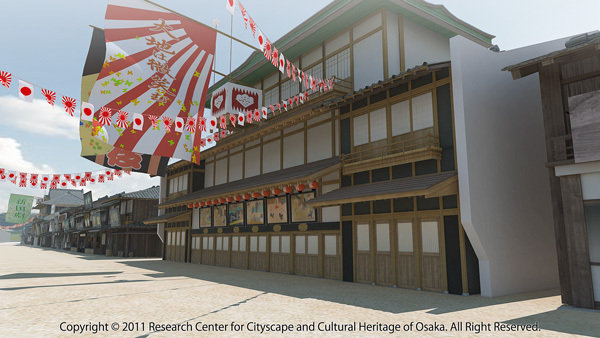 There were many Kabuki, Nou and some other traditional style theaters built as well as many tea cafes and restaurants. Dotonbori in Osaka is Japanese Broadway. Mr.Chikamatsu Monzaemon is the most famous play writer, known for "Sonezaki Sinju" and "Meido no Hajime". He wrote 130 stories and most of them were played at Takemotoza theater in Dotonbori. Within the play writers industry he was called the Eastern Shakespeare. After he died, Takemotoza produced their masterpieces of kabuki. 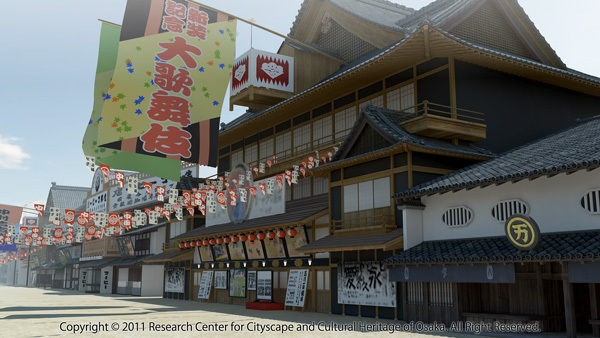 In the Edo Period, people say "Tokyo 3 Za" and "Osaka 5 Za". It means there are 3 great theaters in Tokyo and 5 great theaters in Osaka. 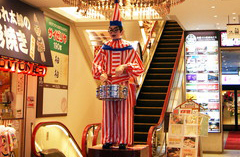 These 5 theaters: Nakza, Kadoza, Bentenza, Asahiza and Takemotoza were representative best theaters of Osaka Dotonbori. In Dotonbori, streets were lined with many small drama theaters like Broadway, making Dotonbori the place that many actors long for. Some Dotonbori some of theaters are closed now, but Kadoza, Kabukiza, Yoshimoto Comedy Theater and many other great theaters are still there and are crowded with people every day. 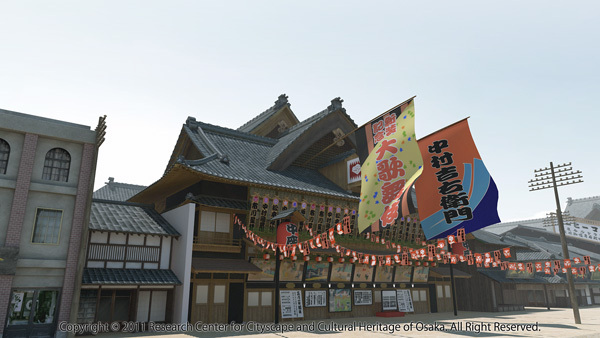 Computer graphics of 5 theaters in Doutonbori. It's located at Kansai Daigaku Osaka Toshi Isan Kenkyuu Center. In the 20th century, jazz was born in America and came to Osaka, Japan via Shanghai. Jazz was a big boom in Osaka at the time. Dotonbori and Soemonchou were lined with many jazz dance halls and jazz cafes, and professional foreign jazz musicians played there. Most of the customers were couples, man and hostess women that were called Geiko. In 1922, at the beginning of the Showa Era, a person who owned a building of Kawai Kaikan produced a Kawai jazz dance team composed of Geiko girls. After the war, jazz culture was still prevalent, and a live hall called "Saito House" near Ebisubashi bridge is the oldest jazz hall in Japan. The Saito House was rebuilt to be a taller structure called Yoshimoto building. The first floor is a performance stage and the second floor is cafe where customers are able to listen to the music from the first floor. Also the name of Saito House was changed to "Shinsaibashi Nichoume Gekijou". Yoshimoto Comedy Agency owns this building which is why this building is an entry stage for beginner comedians. Osaka jazz culture moved from Saito House to Red allow at Hankyu shopping street. Now, the New Suntory Five at OhatsuTenjin Shopping street is the hottest place of jazz. 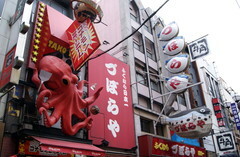 The symbol of the Dotonbori is the many large signboards. These signboards are often covered with media like TV and magazines. The most popular one is the Glico signboard. The design pictures a sportsman standing with his arms open with many landmarks of Osaka behind him. In the Dotonbori area there are huge LED signboards that decorate Dotonbori perfectly. 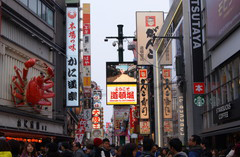 We feel the powerful energy of the Dotonbori area thorough these large signboards. Not only the signboards but some large dolls are around as well. The Kuidaore Tarou Doll is one of the popular guy who play bell and drum. A kushikatsu restaurant manager doll who says "Do not dip twice" is also quite famous here. It is totally fun here, like a theme park!! Various dolls welcome you to visit Osaka!! Doutonbori downtown lined with large sign boards. The national characters of Japanese are different for each place. We often say Kobe people are Hakidaore, Kyoto people are Kidaore and Osaka people are Kuidaore. This means people who live in Kobe are extravagant in shoes, Kyoto people in dress, and Osaka people in food. People who live in Osaka are very fussy over foods. People from Osaka choose ingredients very carefully and never trash any foods. The bay of Osaka used to have a very strong tide. Sardine inhabit the Osaka bay, so predatory fish that feed on the sardine are attracted and fisherman catch them. Osaka always has fresh fish. This is why Osaka Nanba write this symbolic letter 難波 or 魚庭. 難 means "strongly difficult" and 波 means "the tide". 魚 means "a fish". 庭 means "a garden." There are great producers of onion, eggplant, and potato in Sensyu Osaka and a great producer of eggplant, beans and potatoes in Kawachi Osaka. Osaka temperature is quite warm so good vegetables grow , and Yodogawa river provides Biwako-lake's clean water for Osaka and good bay fish. These main reasons explain why Osaka people are fussy for food. If we explain Osaka food culture in short words, "It has thin refined taste and deep flavor". Osaka's cooking style mainly uses broth for most dishes. All of the local food products gather in Osaka so people can make the best broth by using many kinds of incredible ingredients. Hokkaido's kombu sea weed, Tosa's dried bonito and Osaka's small dried sardines are all good examples. These ingredients are another reason why Osaka food is so delicious. Many other food cultures use strong sources for dishes, but Osaka food doesn't use as many sources because strong sources reset their material taste and the ingredient's color too. People use of taste of the material and we put weak taste source on it. Japanese cooking uses Japanese sake like wine for French dishes. Osaka is a really great origin of Sake. Using the best ingredients and perfect sake leads to developing high-quality food culture. Osaka has everything that is needed for good meal since a long time ago.